You should come to Brunei. It won't be your usual busy place, but you should come because it's different. Brunei forces you to be calm and relaxed, and it even forces you to change your life. I'm kidding of course. No place can change you without your permission. 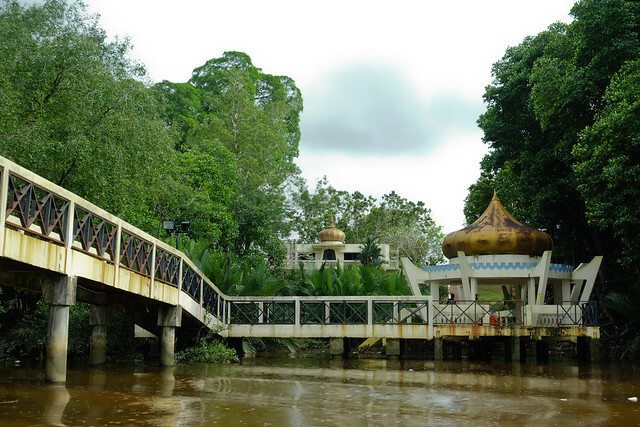 If you ever find yourself in this little Borneo country, head on over to the Brunei River and schedule an afternoon tour, preferably just before sunset. 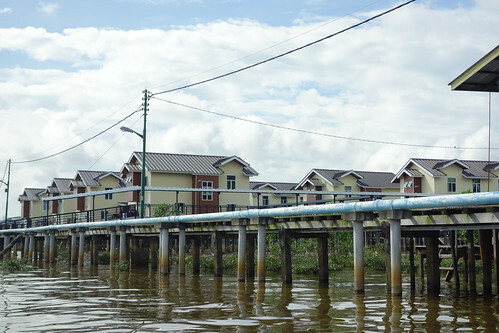 From across the river, one might think that this is a slum area, much like what we see here in our country. But upon a closer look, you'll find a gasoline station, several mosques, and schools, all in stilts. Oh also, you'll find the houses with air-con and cable satellite dish installed. Oh and did I mention there's a government housing too? 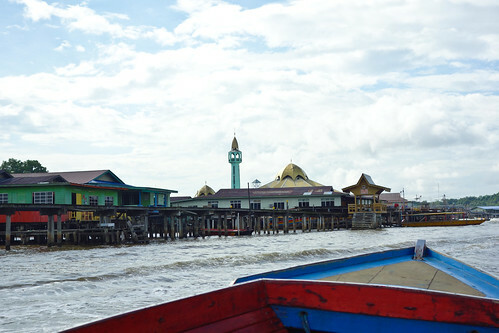 Kampong Ayer is accessible via water taxis, found along the Royal Wharf in Bandar. 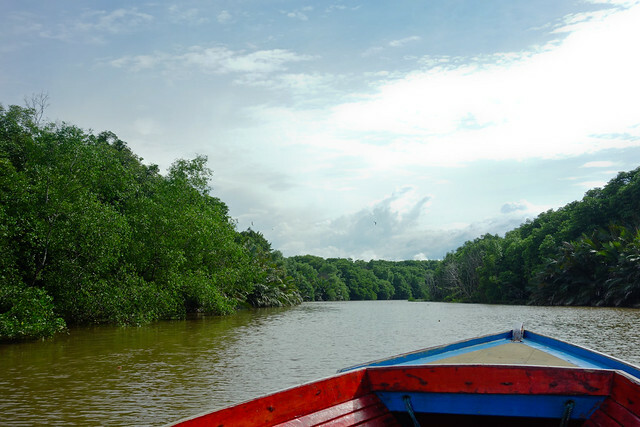 You can hire a boat to tour around the village and to go deep into the mangroves to see the proboscis monkeys. 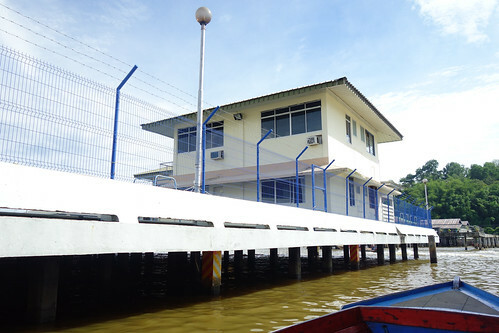 If you have ample time, you can ask the boatman to wait for you as you explore Kampong Ayer on foot. Haggle with the boatman as they tend to have a high asking price. Mine asked for 50BND but I haggled for a couple of minutes before we finally agreed at 30BND. I heard some people were able to bring their fare down to 15BND though. The boatman will take you upstream and deeper into the mangrove. On the way you will pass by historical sites such as this one. The photo below is of the old Royal Cemetery, where generations of the Royal Family used to be buried. 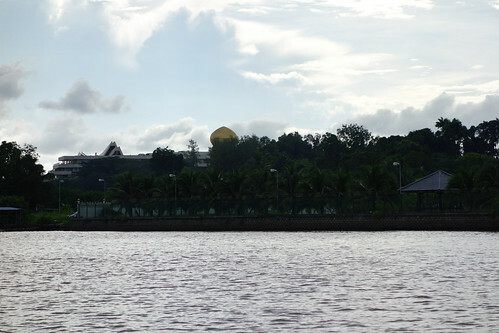 On the river banks you will also see the Royal Family's jetty port as well as the dome of the Istana Nurul Iman, the official residence of the Sultan of Brunei and is recognized as the largest residential palace in the world by the Guinness Book of World Records. Interestingly, the palace was designed by Leandro Locsin, a Filipino architect. Too bad it is not open to the public and we can only see the dome. Now, compare that speck of dome with the photo below. 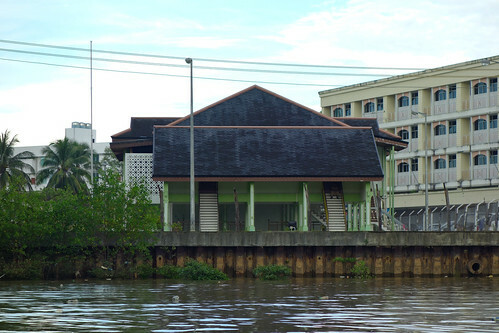 That used to be the official residence of the Sultan, before oil was discovered in Brunei. See what riches oil can bring to a country? AKA the long-nosed monkeys. Note that this specie is endemic to Borneo. 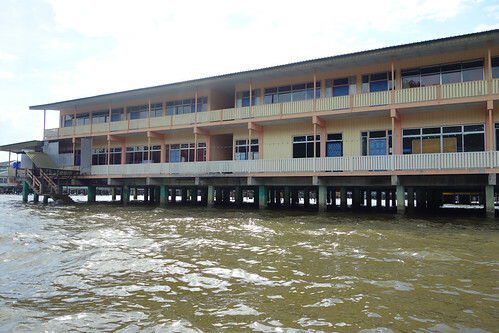 You can find them half an hour away from Kampong Ayer. 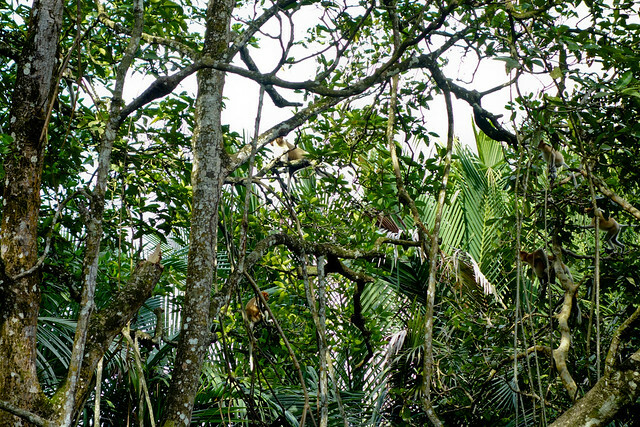 The area will grow quieter and you will be enveloped in an endless sight of mangroves. The boatman will then try to spot where the proboscis monkeys are. They live in groups and are usually easy to spot. When you hear leaves thrashing and honking sounds, you will most likely find them there. I felt funny after seeing a proboscis monkey. The resemblance of this specie to how some of us humans look like is amusing and eerie at the same time. Long nose and big belly, I'm pretty sure that would remind you of someone you know. Kidding! The truth is, I'm quite scared of dark, murky fresh waters. I can't help but picture crocodiles and snakes lurking nearby. 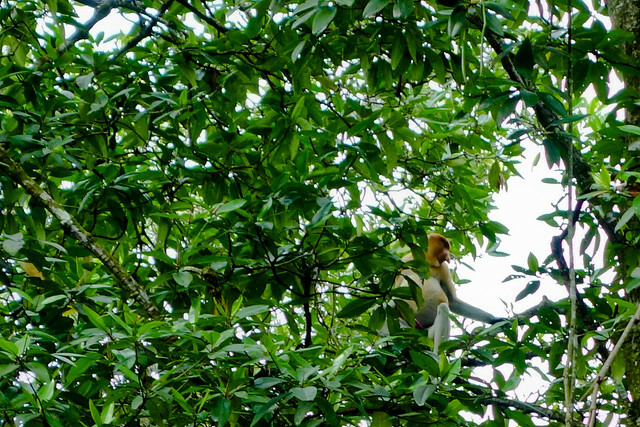 However, seeing the proboscis monkeys in their habitat from a few feet way entertained me more than I thought it would. Plus the novelty of seeing people luxuriously living in the water piqued my interest. 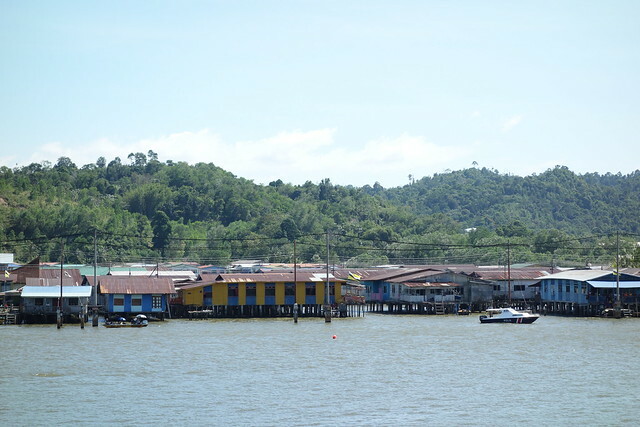 And just so you know, most people who live in Kampong Ayer have their cars parked across the river. How cool is that?